Mortal Coil Performance Society is dedicated to creating imaginative theatre and spectacle for audiences young and old. Our artistic vision is grand. We bring a sense of magic and myth to our performing characters through the use of stilts, masks and fantastic costuming. The company’s creative and original work is presented at festivals, in theatres and at site-specific events. We also develop and teach classes, workshops and lecture/demonstrations on the performing arts to the general public, educators and professional performers. 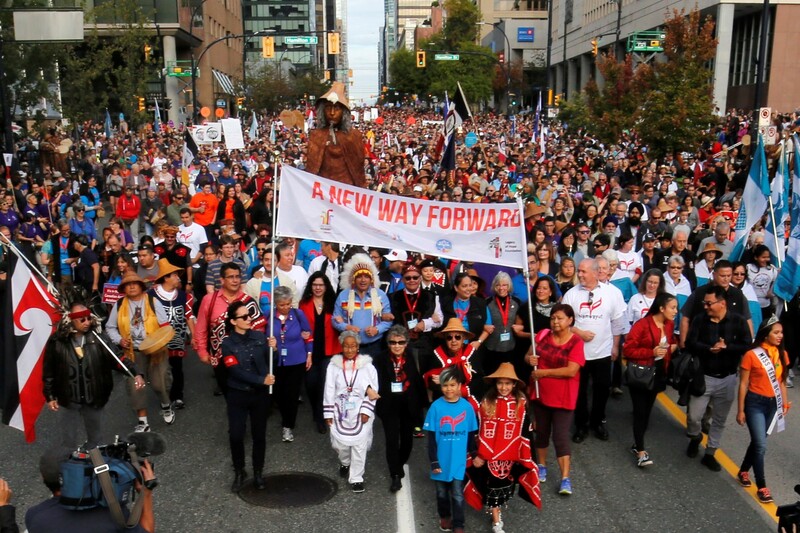 We acknowledge and honour that our work takes place on the unceded territory of the Coast Salish peoples, including the territories of the xʷməθkwəy̓əm (Musqueam), Skwxwú7mesh (Squamish), Stó:lō and Səl̓ílwətaʔ/Selilwitulh (Tsleil-Waututh) Nations. Mortal Coil continues to partner with Tsatsu Stalqayu (Coastal Wolfpack) on our joint project, First Contact. We are pleased to announce that the Coast Salish puppet, Meh, will be the welcoming figure at the Museum of Anthropology's Audain Gallery summer show, Shadow, Strings and other things. Puppet movement and body designed by Che Campbell, Barb Clayden, Peter Hall, Frank Rader, with regalia and clothing designed and traditionally woven by Coast Salish artist Iona Paul. Tsatsu Stalqyu and Meh will also be performing at the 42nd Annual Vancouver Folk Music Festival, July 19 - 21, 2019. Look for the CD of their original songs that is being recorded this spring for sale there. Mortal Coil is proud to be partnering with North Vancouver's Presentation House Theatre on First Welcome - Hych'ka. A Celebration of 1st Meetings between people, cultures and species, this community based summer long project will culminate in a day long event on September 30, 2017 at Waterfront Park in Lower Lonsdale. The day will include Mortal Coil's stilted characters, the large puppet, Uzume Taiko, Tsatsu Tsalqya (the Coastal Wolf Pack), community choirs and a sharing of stories, food and performances. During the summer, the Giant Puppet will be appearing in many local events from Richmond to North Vancouver to Vancouver's Granville Island. Mortal Coil will also be offering mask, stilt and puppet making workshops throughout North Vancouver. For a full schedule of these events, please go to First Welcome Hych'ka. We were honoured to launch our new Gulliver Puppet at the Musqueam Reserve on National Aboriginal Day, June 21, 2016. Inspired by the title character in Jonathan Swift's classic novel, he will be an integral part of our next summer's production. A work in progress, we hope to present him around the Lower Mainland over the summer and continue to develop him - in the meantime, enjoy! We are proud to be partnering with the Sharing Farm and the City of Richmond on a new site specific production for children and families about the many - seen and unseen - lives that are found on a working farm. 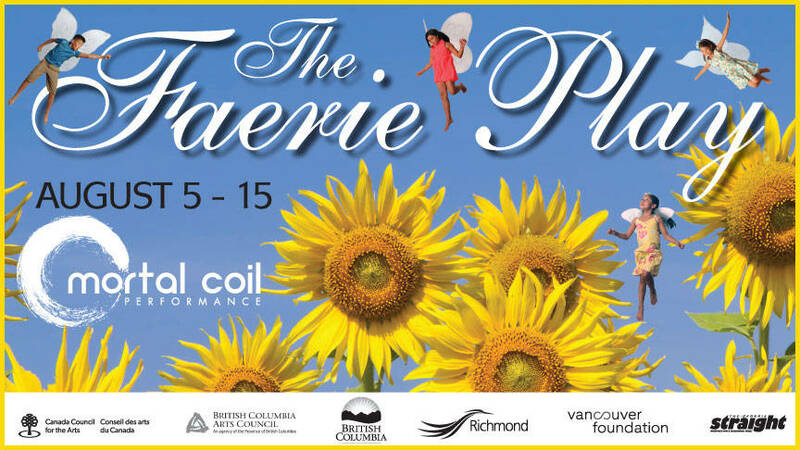 For more info on the show The Faerie Play and for tickets, please go to Brown Paper Tickets. The showgoes ahead, rain or shine! Get a load of our new logo! Designed by the multi talented (and font genius) James Glen, we love our new look. We are thrilled that we have received an Innovations award from the BC Arts Council in the most recent round of funding (January 2014). This grant is for the development of a large puppet (think over 12 feet) that will eventually be part of a production of Gulliver's Travels. We've moved our offices to the new Arts Factory at 281 Industrial Avenue. We're thrilled to be a part of such a wonderful project and look forward to working next to everyone who will be in the building. The company's creative and original work can be presented to audiences in theatres, at festivals and at site specific events. We also develop and teach classes, workshops and lecture/demonstrations on the performing arts to the general public, educators and professional performers. "Every ounce of grownup cynicism and tension was gone, replaced by this weird, familiar feeling of childlike wonder. That is the magic of Mortal Coil’s new site-specific work, The Faerie Play." "Hands down, the most bizarre, bewitching and wildly creative performance of the day." "One of the most magical groups Vancouver has to offer...they delighted crowds... and danced with seemingly impossible balance." "Watching Mortal Coil was like floating, untethered in the work of Marc Chagall...the delight they invoked in me was childlike and completely luxurious."